Without a defined face, without crisp lines marking where a body ends and the environment begins, a person as viewed through a thermal camera can seem a loose arrangement of simple colors and shapes. 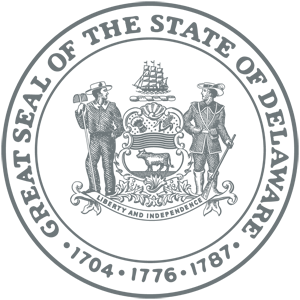 A person, rendered as a heat signature for analyzation by airport or border security personnel, becomes an object. He painted the submitted works with oil on canvases he describes as “incredibly, intensely flat” – most are square, up to 5-by-5 feet, and poke just an inch-and-a-half away from the wall. 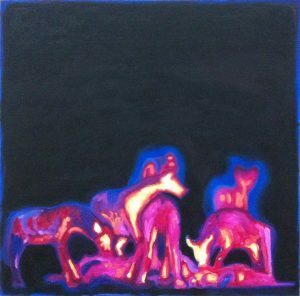 Some of his paintings were inspired by thermal images he found online – of passengers standing in lines at security checkpoints, for example, as seen through an airport’s thermal scanner; or of a pack of hyenas feasting on a fresh kill, the predators and prey glowing in shades of red and yellow against a black night sky. Others were spawned by domestic images he made with a rented thermal camera. 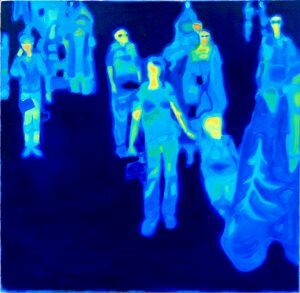 The subjects of his paintings have only vague outlines, which correlates with the fact that thermal cameras capture no visible light, only differences in heat signatures. The oil paints, of which he uses only four colors (cyan, magenta, yellow and black, or CMYK, which thermal cameras also use), dry very slowly, providing a sort of procedural parallel – just as the heat depicted in images from thermal cameras creates hazy, blurred edges, the oils, usually painted light to dark, pull at each other over the course of the two or three days Winn spends painting each piece. 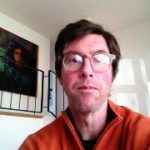 Winn is a professor at the University of Delaware, where he runs the master of fine arts program and teaches graduate and undergraduate classes that range between theory and studio practice. The grant, he says, primarily will go toward supplies – he wants to experiment with material conditions, and to be able to continue to take risks with the work. Winn will have a solo exhibition of his work in November at the Chris White Gallery in Wilmington. For more, visit www.lancewinn.com.